The AccuWeather Regional Radar shows heavy rain from Colorado and Missouri south to San Antonio. To try to describe all of the areas at risk of flooding in a blog is impossible. 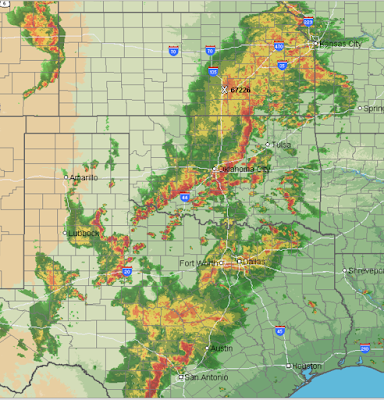 If you are in the areas of Kansas-Oklahoma-Texas where heavy rain is falling, I urge you not to try to drive unless there is a serious reason to do so. Flooding is especially dangerous at night. This is the last update for the night.